Telemachus: Will Obama Be Like Nixon and 'Go to China'? First things first: Does anyone believe that had the Democratic nominee this year been Joe Biden or even Hillary Clinton that we would not be talking about the agenda of 'President Mitt Romney-45th President of the United States of America' today? Seriously. With this economic record and really no mandate or even an agenda going forward, could any other person in America have been re-elected to the highest office in the land? Let's call it the 'cult of personality' and leave it to future historians to dissect and analyze how Barack Obama was able to pull off re-election in 2012 in spite of 23 million people being un/underemployed in an economy that is about as still as a stagnant pond that doesn't have any fresh water running through it. That plus the simply enormous get-out-the-vote machinery he had in every swing state except Indiana and North Carolina that he carried Tuesday night. He has the charisma and mass appeal of a Ronald Reagan and they come around about as often as Haley's Comet in American political life. We just happen to have had 2 of them in the last 32 years. 1) What exactly is President Obama's agenda for the next four years, other than 'doing the same things we have done for the last 4 years' which haven't exactly gone gangbusters yet, has it? 2) Will President Obama take a cue from President Nixon (no, not resign over 'Benghazi-gate', you know that investigation is coming, don't you?) and 'Go To China!'? What we mean by that is will President Obama go against his own rhetoric and political stripes and spots and show the same 'flexibility' with the Republican Congress as he has promised to show Russian President Vladimir Putin in his 'private' talks with Prime Minister Dmitry Medvedev that wound up being 'not so private 'when picked up by a hot microphone? President Richard Nixon, when elected in 1968 and way before then, was known as a rock-ribbed, staunch anti-communist. 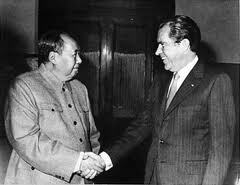 However, in 1972, after a round of 'ping-pong diplomacy' engineered by Henry Kissinger, President Nixon physically went to visit Chairman Mao Zedong on the soil of Communist Red China in an act of diplomacy that stunned the Western and Eastern worlds. It opened up trade relations with China and ushered in a economic revolution in China that is running unabated for the most part today. But the term: 'Nixon goes to China' has come to mean any time a politician goes against his/her stated principles in order to achieve some higher order of good for the nation'. It doesn't happen very often. George H. W. Bush 41 did it in 1990 when he signed the 1990 Budget Act that instituted PAYGO rules and discretionary spending caps and included some tax hikes such as cigarette and yacht taxes. However, it is well-established fact by now that the 1990 Budget Act established a direct line to the balanced budgets America enjoyed from 1998-2001. That one single provision would save trillions of dollars over coming decades in America. Raising it to 70 would do it that much faster. There is a plethora of other spending restrictions that President Obama can agree to if the Republican Congress and Democrat Senate will agree to send them to him to sign. Congress will always hold the upper hand in budget negotiations with any President simply because close to half the Constitution deals with the powers vested in Congress in this regard. The President? He has exactly one power in any budget matter. The veto. That is it. You can look it up yourself. Tip O'Neill 'made' President Reagan yield to the demands of a Democratic Congress when they 'saved Social Security' in 1983. The Democratic Congress 'made' President Bush 41 yield to the minor tax increases in 1990 in return for his insistence on the PAYGO requirements among other budget process reforms. Now, the only problem will be if the Republican-led Congress doesn't make President Obama 'yield' to their stated demands of fiscal sanity and restraint by not sending him any legislation with anything like PAYGO or spending caps or budget reform in it to sign. If they don't, then they will become as inept and worthless on budget restraint as the GOP Congress was from 2001-2006 when they spent money like drunken sailors...'with all due respects to drunken sailors' as Ronald Reagan once said.